Back in those days, they did not have individual copies of the book of Revelation. The only way one could hear the message of the book was when it was read out in church gatherings. “Then He said to them, “Take heed what you hear. With the same measure you use, it will be measured to you; and to you who hear, more will be given. One of the secrets to receiving more is how you hear. This is one of the scriptural ways to increase. b]What you hear is important because it either brings faith or fear. Just as faith comes by hearing and hearing by the Word of God (Romans 10:17), fear comes by hearing the word of the devil. Fear grows when you entertain his threats of the future and his boasts about the past. Today, many Christians have a very good head knowledge of the bible but very few put into practice what they already know. Many are on the lookout for so called exotic or deep teachings. Everywhere I go people tell me “Pastor Michael, I want deep teachings.” Sometimes, I feel like telling such people. Don't go too deep or else finding you will be difficult. Now don't get me wrong. I like to go deeper in the word. However, there are people who have not put foundational teachings in place and all they want is to ‘go deep’. Lord Jesus spoke about seed that was sown. Some seed brought a thirty fold harvest, some a sixty and some a hundredfold. I believe that when you just read the Word, it will bring a thirty fold harvest, and when you read and hear the Word, it will bring a sixty fold harvest. However, when you read, hear and put those things into practice, you will bring a hundred fold harvest. Obedience means far more to the God than mere head knowledge of His Word. I know of a friend who has half the Gym equipment at home. Curiously, I asked him, “Don’t you work out.” Jokingly he replied, “Yes! Every day at four o'clock I get a dream in which I am working out.” Many Christians are like that. They know a lot but they never put things that which they know into practice. It's time to build spiritual muscles. Father, in the name of Jesus, help me get into Your word daily. 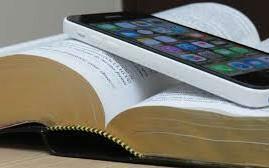 Give me grace to diligently read the bible daily. Father, in the name of Jesus, give me grace and wisdom to apply Your word to my daily life.